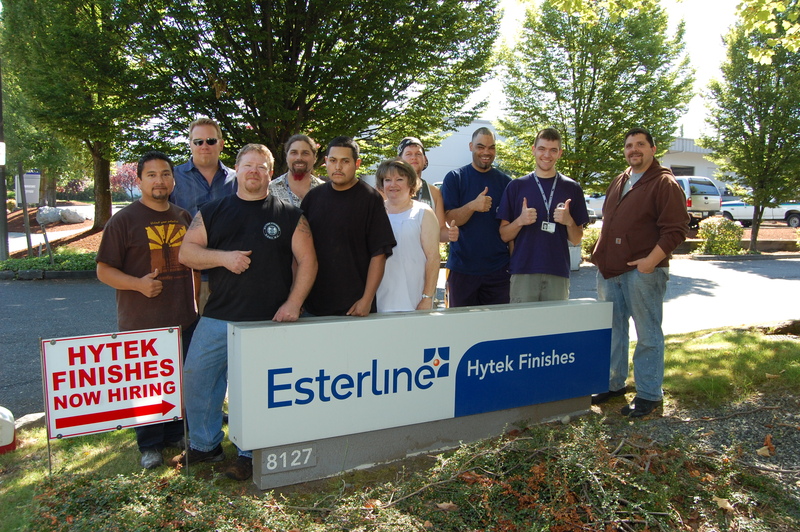 By more than a two-to-one margin, 165 workers at Hytek Finishes in Kent, WA voted to join the IAM. The election capped a four-month organizing effort by Seattle District Lodge 751, initiated by Hytek employees who approached the District for help. The workers specialize in various types of metal finishing and coating for aerospace manufacturers, including Boeing, Lockheed and Bell Helicopters. “It was a ruthless, half-truth, anti-union campaign,” said District 751 Organizer Jesse Cote. Hytek, a subsidiary of Esterline Corp., hired anti-union professionals to thwart the campaign, held captive-audience meetings and spread false rumors; one being that key customers threatened to pull work from the company if the workers voted to join the IAM. “The fact that so many people voted in favor of joining the union in the face of those threats speaks volumes about the character and integrity of the workers at Hytek,” said District 751 President and Directing Business Representative Tom Wroblewski. Wroblewski also noted that Esterline turned a profit of $46 million in its most-recent quarter, a 58-percent increase over the same quarter last year. The next step for the new Machinists at Hytek will be to negotiate a contract. District 751 has filed information requests with the company, asking for dates when talks can begin.